With the coming of the Matariki, the Maori New Year, the 2014/15 maramataka or calendar was launched at a ceremony held at Raukawa Marae on June 30. The celebration began with powhiri, with special guests, Brigadier Peter Kelly and Warrant Officer Tama Andrew from Waiouru Military Camp, Mayor Ross Church and some councillors and staff members from Kapiti Coast District Council. Following the powhiri, Otaki iwi representative, Te Waari Carkeek, blessed the new maramataka and they were distributed to all present. He went on to speak of the 2227 members of the Maori Pioneer Battalion and the 458 Pacific Islander, who also fought with them at Gallipoli and in France. They were highly regarded soldiers on the front in France, their trenches were far superior to any others! “We carry on our shoulders what our forebears have done. We need the knowledge of our forebears on how to do things – (like) build trenches!” he said. Rupene Waaka, Raukawa Marae chairman, spoke of the Otaki “boys” who signed up with the first contingent, during October and November 1914, seven were back home within a few months having been discharged as unfit to serve or for “misconduct”! Some served continuously after leaving on the troop ship, SS Warrimoo, in February 1915 until and the last members finally reached home again in 1919. All 518 tribes were represented in the original battalion. 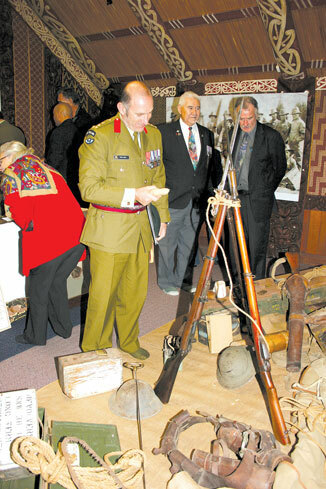 After the formalities, the visitors were invited to view the display of World War I memorabilia loaned by family members. These will be included in the WWI 100th year commemoration exhibition opening at the Otaki Bank Museum at the beginning of August. This year’s calendar, it runs July through to June next year, is dedicated to the NZ Maori Pioneer Battalion, particularly those from the Otaki District which covered Manakau to Waikanae.